The key benefit of a CINDERS grill is how it folds away. To set it up, first hold the unit on its side edge and swing the legs fully away from you. The inner leg struts can then be unfolded and clipped into position. The lighting instructions are in the Users Instructions leaflet and on the metal data plate pinned to the wood end of every grill. The lighting hole is a brass component, located centrally underneath each firebox. There are two fireboxes on the Slimfold TG160, and each must be turned on and a gas match applied to its lighting hole independently. Lighting is simple and safe, but if you don’t succeed immediately you must turn off the gas and allow the unburned gas to escape to the atmosphere before trying again. The Slimfold SG80 has one firebox. The heat of the grill. This is boosted by covering the grill with food and boosted again when fat is rendered out onto the heat exchanger beneath. The thickness and initial temperature of the food. Grill food from an ambient temperature if time permits, or pre-cook chicken legs and ‘flash’ them over the grill if the pressure is on to feed a queue. The strength and coolness of the wind. A soft breeze can help to carry away smoke, but its best to protect the food from a chilling wind. The control knobs can regulate the heat of the grill and the viewing holes in the side of the fireboxes are provided to check flames. The more food on the grill, the hotter it gets. Burning fat and the fact that each firebox will build up heat if ventilation through the grill is restricted are the reasons. This is to your advantage as a slow cooking single item will hold your customer and attract others, while a full grill means you have to get a move on. Wafer thin steak cuts take almost thirty seconds a side, while a one-inch thick steak, irrelevant of overall size and weight, can take five minutes a side, particularly if taken straight from the refrigerator. Beware of exposing frozen or even very chilled food to an intense heat as the middle may well remain uncooked. A thousand burgers in a single, short day is well within the capacity of a Cinders six-foot grill. A continuous, cool wind can slow down cooking unless a windbreak is strategically placed to allow you to continue cooking at speed. Flare-ups can attract the crowds and are not detrimental to the grill, but they are of no use for continuous catering production. The solution is to control the amount of fat in the food to be cooked. Do not take this to the extreme or the result will be a boring smokeless, flameless and rather slow presentation without grill flavour. Simply trim some fat from steaks, leaving enough to create the grill effects and smoked flavour in the food. You are totally in control, even to brushing an emulsion of wine and oil onto very lean meats or poultry fillets. Remember: ‘100% meat’ burgers simply means there is no rusk in the mix. This leaves a 100% animal component of lean meat, fat, and offal. Sometimes a flatter rusked burger is best for reducing flares and when fast production is needed. The grill must be fully ‘seasoned’ before peak efficiency and flavour is achieved. This occurs naturally during use and builds over the years, so the oldest CINDERS grills are often the most cherished. Seasoning can be accelerated by throwing herbs, wood chips, and other organic matter through the slots in the grilling surface and burning off. The grill will not be adversely affected and this procedure is recommended before first use. Food should be put on the grill and left long enough to seal in the juices. This means not ‘fiddling’ with what you are cooking, particularly in the early stages. At the same time as the food is being seared, some fat or fatty juices will exude between it and the grill and lift it from the surface. Confidence is the order of the day. 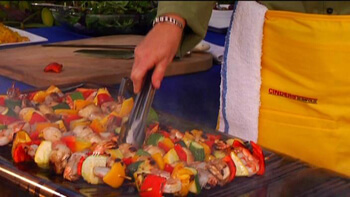 The unique stainless steel grill will protect food from burning during the initial searing. The only problem may arise if carbon deposits are allowed to build up where the grill has been used and the food residue allowed to burn dry. The dry absorbent carbon may soak up the meat juices and prevent separation. 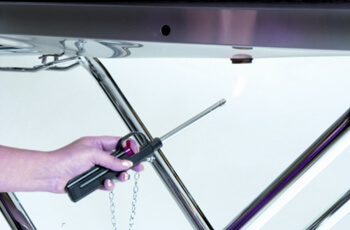 Regular cleaning is the solution, either with a stiff wire brush or by sliding the griddle accessory over to reduce the carbon to a fluffy white powder by reflected heat. Limiting the use of thick sauce type coatings reduces the accumulation. A drain hole is located at either end of the Slimfold TG160 and at one end of the single firebox Slimfold SG80. The pictures below show a ring-pull can being introduced onto the stainless steel pin to catch excess fat. In the field, this is rarely used and not much gets passed the extremely efficient heat exchanger. The internals of all CINDERS grills are self-cleaning. It is actually desirable that some carbon builds up on the heat exchanger below the grill, as this is what gives the true charcoal flavour. Charcoal is carbon, -nothing more. The firebox is extremely high grade stainless steel, but for extra long life the grill should be left running long enough to burn out all fatty deposits and convert them to carbon in the form of smoke particles, black carbon, or white fluffy residue. An ejection vent is situated at one end of a firebox to get rid of loose particles when the unit is stored on end, but no particular effort is required and this occurs with normal movement. A very effective method of cleaning the grill top after burning dry the internals is to slide our solid griddle over the grill area and leave the unit running. The amount of time this takes depends upon what type of food has been cooked and over what time period. A usual estimate is to wait a few minutes after the grill has stopped smoking and the carbon on the grill surface will have converted to white powder and can be literally blown or brushed away. This is the quickest and easiest method of cleaning. Alternatively, after burning off the internals, the grill top can be cleaned and finished with a scrub pad. It is also acceptable to use a proprietary stainless steel cleaner if you choose. The burners will not block with the cleaning residue, but the grill should be burned dry before storage. Storage should be in clean, dry and hygienic conditions as far as practical. CINDERS grills burn completely dry and free from dripping grease. They also fold down to under eight inches flat with no separate or loose components. There is therefore no reason why the units should not be stored in an upright position after every event, preventing theft, vandalism and vermin contamination. The units can even be hung on a wall for long-term storage.